Inside the new Golden Pliers. 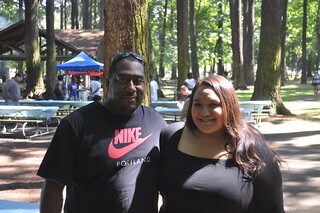 Owners Kevin Purcell and Becky Newman. Portland’s newest bike shop quietly opened its doors on Friday. 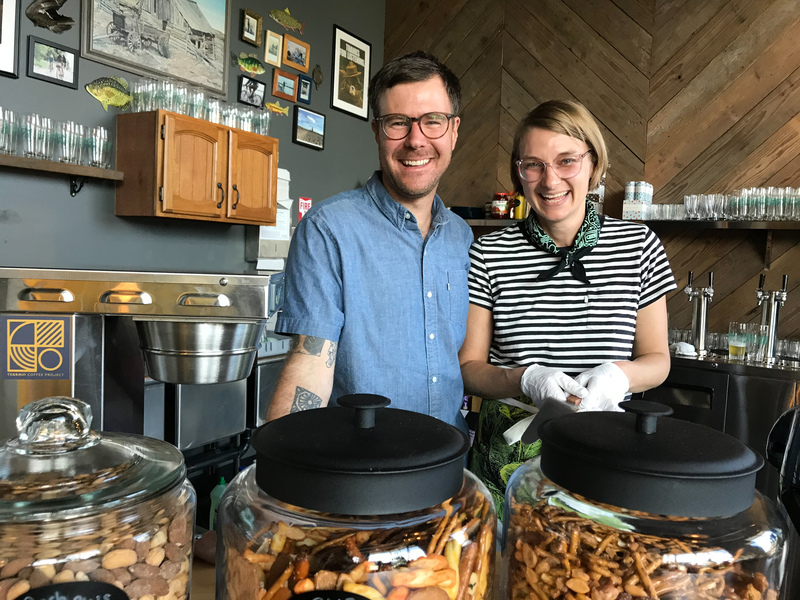 Kevin Purcell and Becky Newman are the people behind Golden Pliers, a small shop and cafe at 1451 N Skidmore (just east of Interstate) that will focus on repairs and carefully selected accessories. 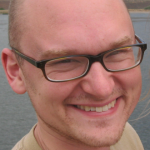 Purcell is a former service mechanic at River City Bicycles and more recently, manager of 21st Avenue Bicycles, a shop that closed its doors last month. 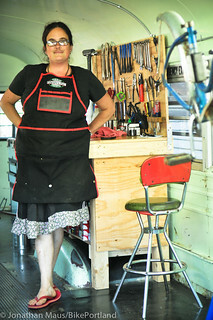 Newman is the owner of Makeshifter Canvas Works, where she handcrafts bags, apparel and other accessories — many of which are now sold in Golden Pliers. 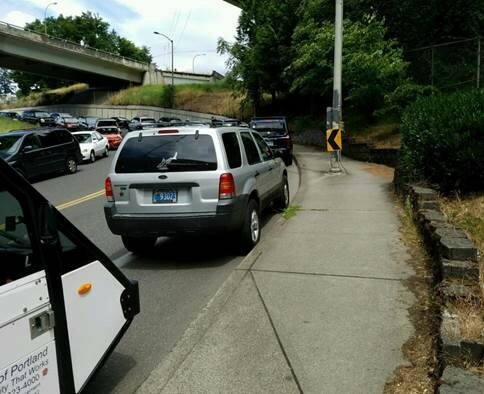 PBOT wants to know if you prefer a beefier median at Villard. As paving machines and bulldozers rumble and beep along North Rosa Parks Way today as part of a repaving project that started a few weeks ago, the Portland Bureau of Transportation is considering a last-minute change to the project they say provides even more protection for people walking and bicycling. At issue is the crossing of Rosa Parks at Villard, a street between Willamette Blvd and Greeley Ave. Currently there’s no marked crossing at Villard. That leaves just over 1,100 feet of this neighborhood collector street without a clear and safe place to cross. Back in March we shared PBOT’s initial design proposal which included two zebra-striped crosswalks and median islands in the middle of the street. As a partial median, the design would do nothing to limit driving movements. 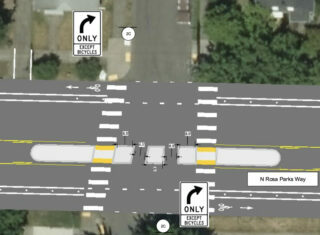 Now PBOT says they have the “opportunity” to upgrade this design further by making it a full median diverter that would prohibit some turns for auto users while still allowing bicycle riders to get through. The new median spans well beyond the intersection. 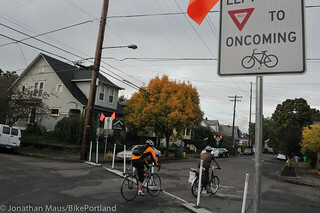 North Portland’s streets continue to evolve as a combination of neighborhood demands, City of Portland paving projects, and opportunistic activism are coming together to make significant changes to bikeways. A man was hit and killed last night just two blocks from where young Bradley Fortner was nearly killed while walking to school last year. 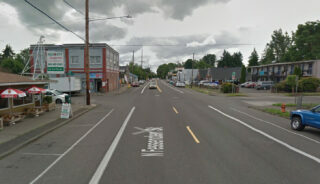 Portland Police reported late last night that a man was “struck by a vehicle in the 7000 block of North Fessenden.” That would put it near the intersection of N Midway, which is relatively busy with a taqueria, a corner store, bus stops, and apartment complexes. We don’t know many details yet, but police say it was a hit-and-run and they’re looking for a dark colored sedan with front-end damage. By our count, this is the 48th traffic-related fatality in Portland so far this year (the Portland Bureau of Transportation, who uses state and federal criteria to count fatalities, has the number at 43). There were 44 fatalities on our roads in 2016 and December is typically one of the deadliest months of the year. Somebody started it and many others decided to follow suit. Bad idea. When an urban neighborhood holds a beloved street festival, space becomes scarce — and less space-efficient transportation options become a much worse way to get there. daily bike commute before his 2013 collision. A man whose legs were paralyzed in an unsolved 2013 hit-and-run on Interstate Avenue has sued the city, state and regional transit agency for $21 million. 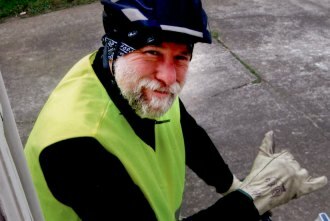 Mike Cooley’s wife Lori, who is also a plaintiff in the lawsuit, told us in a May interview that she’s motivated in part by the lack of changes to Interstate Avenue’s bike lanes despite years of serious collisions on the street. Rodney Avenue, already a decent low-stress alternative to the Vancouver-Williams couplet, is lined up for an upgrade to full neighborhood greenway status. At an open house next Wednesday evening, the Portland Bureau of Transportation will be asking people for their thoughts on the plans. 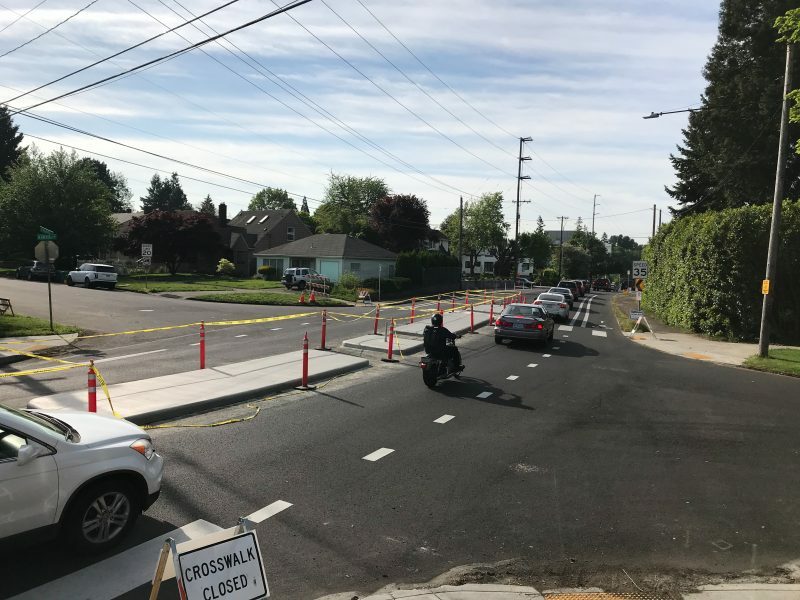 To make the route comfortable for all riders, the city will need to find good ways to help people navigate two jogs in the street grid, at NE Alberta and NE Fremont (pictured below). 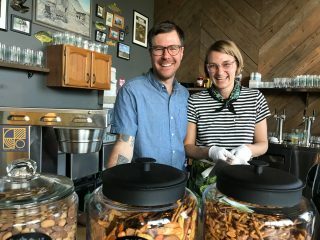 After two years of operating a satellite bike repair shed in North Portland’s public mixed-income New Columbia community, the Community Cycling Center is deepening its community involvement. The nonprofit bike shop and biking-for-everyone advocacy group is combining bike events and education with a rising educational philosophy known as “Thrive” in an effort to help residents change their city for the better. which is home to her new bike repair shop. There’s a new bike repair shop that’s open for business just a half-block off the busy N Williams Avenue bike corridor. 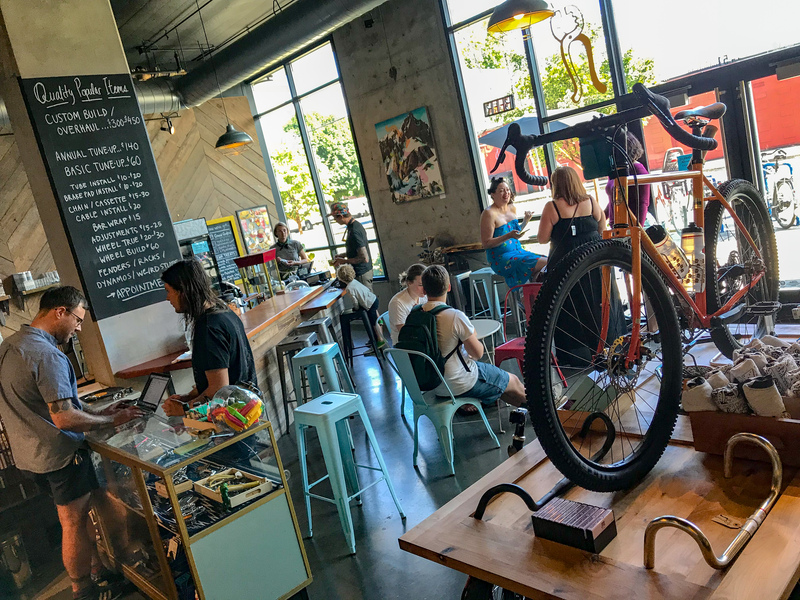 Sherifa Roach, a nearby resident, recent United Bicycle Institute graduate and veteran volunteer at local bike shops, has opened Black Bird Bicycle Repair at 104 N. Failing Street (between Williams and Vancouver). I’d heard from a few sources that someone was operating a bike shop out of an old school bus, so I swung by yesterday for a closer look. Sure enough, there was Sherifa, giving away bags of popcorn as part of the RAD event, and smiling in her apron in front of a big purple bus parked in the alleyway behind her. She was proud to give me a tour of the inside (which I found surprisingly roomy). Sherifa pointed out how her partner had completely remodeled the inside of the bus. He wired it up with new electrical outlets, built wooden work benches, installed new lighting, added some security bars for the windows, and built a ramp off the rear door so people can roll their bikes right on up.